A Class initiating circuit uses four wires, and has the EOL device located on the FACP terminal board or at least, inside the cabinet. Figure 3 shows a typical Class A circuit. The circuit operates in the same fashion as a Class B circuit, but the wiring returns to the FACP after the last initiating device. In the event of a wiring break, etc., the trouble circuitry operates and connects line A to line D, and line B to line C, thus effectively shunting out a single break anywhere in the circuit. Alarm operation otherwise is exactly the same as in the Class B circuit. A Class A circuit therefore, has the ability to turn in an alarm in spite of a single break in the circuit. This gives the circuit a greater degree of survivability than the Class B circuit, eliminates the problem of ‘lost’ EOL devices, and makes trouble shooting easier. The main disadvantage is that it requires twice the amount of wires and the codes require that the return pair be run in separate raceways or conduit from the outgoing pair to ensure survivability. One typical trouble situation is often caused by a different trade unknowingly cutting through a conduit. There are numerous horror stories regarding this. A Class B circuit is a two-wire circuit with external EOL. Any device electrically located beyond a break in the field wiring will be disabled. Any devices located electrically before the break will still be able to turn in an alarm. A Class B system is economical, since it only uses two wires, but has several drawbacks, such as survivability, or inability to operate if a device beyond the break goes into alarm. Also, the EOL is often installed in the last initiating device, the location of which is often unknown if a less than competent installer doesn’t document the location at the FACP. Therefore, we see the need to develop a better circuit. The Class A circuit is an answer. 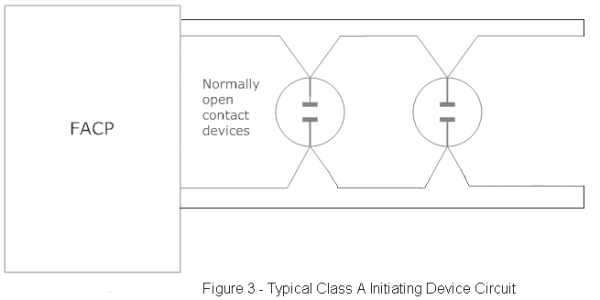 Notification appliances, such as bells, horns, strobes or combination horn/strobes are likewise installed in Class B or Class A configurations. However, the supervision of these appliances is made possible by use of blocking diodes wired internally in each device. As you probably already know, a diode only conducts DC voltage in one direction. If the polarity of the supply voltage is reversed, the diode will become an open circuit, and no conduction occurs. See Figure 4. Every notification appliance is equipped with a blocking diode. Thus the appliance is supervised up to the point of connection to the circuit. The internal coils, etc. are not supervised. Supervisory voltage is applied to the notification appliance circuit, which conducts the current to each appliance where it is blocked by the diode, travels through the EOL device, and back to each appliance and hence to the FACP. In the event of a break or removal of an appliance, the circuit will open, and a trouble condition will occur, just as in an initiating circuit. During alarm, the polarity of the voltage is reversed by panel circuitry, and the blocking diodes conduct the current to the interior components of the appliance. Supervisory circuits are basically used to detect ‘off normal’ conditions in the sprinkler system, if one exists in the building. A supervisory circuit is basically an initiating type of circuit, Class A or B, to which are connected supervisory or ‘tamper’ sprinkler system switches. These switches transfer if a gate valve has been operated to shut off a sprinkler system, if sprinkler pressure is dropping due to a leak, if the water level in a rooftop tank is too low, too high, or if a “freeze up” is imminent, etc., or in general, indicate a problem or tampering with the sprinkler system. In this case, the supervisory switch process the signal in the same manner as an alarm, but the panel circuitry is programmed not to energize the notification appliances or transmit an alarm signal off premises. Instead, the circuit lights its associated LED and the trouble sounder may sound, as the sharing of the audible trouble signal by both trouble and supervisory circuits is permitted. Some- times a single notification appliance may be energized, such as a flashing yellow light, etc. Thus, we see the operation of a simple, basic system. A larger system would have additional initiating circuits, notification appliance circuits, circuits that make off premise notification (fire department) by various means, and control circuits to capture elevators, shut down air circulating equipment, and perform various required auxiliary functions. The next section will cover the devices that place a conventional fire alarm system into alarm known as Initiating Devices.